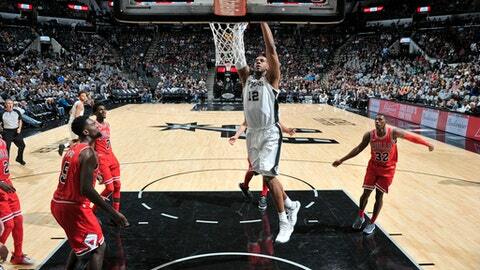 SAN ANTONIO (AP) Pau Gasol had 21 points and 10 rebounds and the short-handed San Antonio Spurs beat the Chicago Bulls 133-94, setting a season-high in points despite missing a third of their roster Saturday night. Dejounte Murray added 17 points and Davis Bertans had 16 points in 18 minutes for San Antonio. Chicago lost rookie forward Lauri Markkanen to a sprained left ankle late in the first half. The severity of the injury is unknown. The Spurs were without six players, including three starters. In addition to Kawhi Leonard and Tony Parker, who have yet to play this season due to quadriceps injuries, San Antonio was also without Danny Green. Manu Ginobili rested on the second night of a back-to-back. The Spurs still had the depth to hand the rebuilding Bulls their fourth straight loss. San Antonio had eight players in double figures. Rudy Gay and Brandon Paul each had 15 points as San Antonio closed out a six-game homestand with four victories. Bryn Forbes, who was making his first career start, had 13 points on 3-for-5 shooting from 3. San Antonio was also almost without Gay, who was ”50/50” with an ailing back, but the veteran forward played 18 minutes. San Antonio raced to a 30-8 lead in the opening quarter, extending the margin to 22 points at the close of the period. The Bulls closed the gap by scoring on 10 straight possessions in the second quarter, but the Spurs regained their dominance in the third. Robin Lopez and Bobby Portis each had 17 points to lead Chicago. Bulls: Chicago had nine steals after averaging 10.3 in its previous three games. … The Bulls trailed by 22 points after the first quarter. It was the Spurs’ largest margin after the opening period since leading by 24 in Chicago in 2014. … Justin Holiday was 1 for 4 on 3-pointers, snapping a 15-game streak in which he made at least two 3s. … The Bulls have lost four straight in San Antonio. Chicago’s last victory at the AT&T Center was Jan. 29, 2014. Spurs: Forbes is the third undrafted player under 6-foot-4 player to start a game in franchise history, joining Avery Johnson and Anthony Carter. … Gay has 10-plus points in 10 of 13 games this season. Ginobili is the only Spurs reserve with more double-digit scoring through 13 games in the past 30 years. Ginobili had 10-plus points in all 13 games in 2008, when he won the Sixth Man of the Year. … The Spurs had two back-to-back games at home in the same month for the first time in franchise history. Bulls: Visit Oklahoma City on Wednesday night to close out their season series with the Thunder. Spurs: Visit Dallas on Tuesday night in their first road game in two weeks.